In our ministry of Reaching, Winning, & Training people around the world with the Good News of Jesus Christ, there is always the anticipation of where God will send me next. Soon, I will be in the land of deserts in Logan, New Mexico, a town of 900 people. From there, I will travel to the land of typhoons in Manila, Philippines, a metro city of over 12,000,000 people. Though these two places are complete opposites, the goal is the same—win souls to Jesus Christ! For the first time in many years I will be conducting an event inside of an American church! October 16-19, we will have a “Harvest Festival” in First Baptist Church of Logan, NM (my home state)! Plus, I will be speaking in the local public schools, talking to the students on issues like drugs & alcohol, peer pressure, and such things. I cannot share about Christianity in the schools, but we will invite the students and teachers to the event. 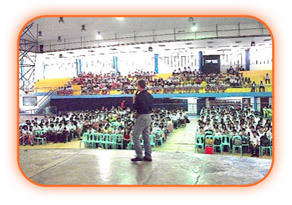 Then, November 7-13, I will be conducting FIVE Community Crusades in Manila, Philippines! These community crusades are local church evangelistic events, which are smaller versions of our larger outdoor crusades. These events will be done as preliminary phases of the larger, outdoor Regionwide Crusade we plan to conduct next year in the same area. These two phases enable us to have a greater impact in a region for Jesus Christ! In tandem with each Community Crusade, we will be conducting outreach School Programs (like the one in the photo below) where I have the freedom to preach Jesus Christ! 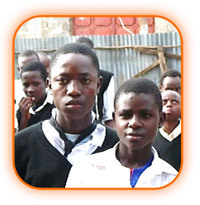 These school programs are tremendous opportunities to reach masses of youth with the Gospel! 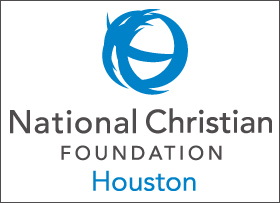 In between these events, I will travel to Dallas, TX, to attend the Luis Palau “Next Generation Alliance (NGA)” Conference for vocational evangelists, November 3. This will be a time for traveling evangelists to get together for fellowship, encouragement, and networking. Find our ministry on social media for daily photos, posts, and updates! We are on Facebook, Twitter, LinkedIn, Vimeo, and YouTube. Find us, friend us, and invite your social media friends to our pages! Below is my upcoming schedule. Please pray for lives to be changed through these events! Thank you for your prayers & donations to our ministry! I could not do this ministry without you!